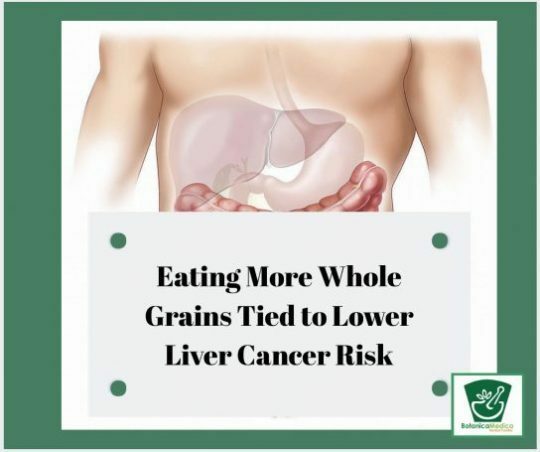 Higher intake of whole grains and possibly cereal fiber and bran may be associated with reduced risk of hepatocellular carcinoma (HCC) among adults in the United States, according to a large observational study of two health professional cohorts with long follow-up. Diet is suspected as a possible important risk factor for hepatocellular carcinoma, but only heavy alcohol use and certain fungus-contaminated foods (eg, affected nuts and spices) have been established as such, say study authors led by Xuehong Zhang, MD, ScD, Brigham and Women’s Hospital and Harvard Medical School, Boston. So the investigators turned their attention to other foods. The team performed a cohort study among 125,455 participants from the Nurses’ Health Study and the Health Professionals Follow-up Study and looked at the intake of whole grains, their subcomponents (bran and germ), and dietary fiber (cereal, fruit, and vegetable). Study participants from both cohorts were scheduled to fill out food questionnaires every two years. Investigators divided study subjects into tertiles based on their levels of consumption of the study foods. After an average follow-up of 24 years among the participants, there were 141 patients identified with hepatocellular carcinoma, which is a very low incidence cancer type. The team reports that increased whole-grain intake was significantly associated with lower risk of hepatocellular carcinoma (the highest vs lowest tertile intake: hazard ratio [HR], 0.63; P = .04 for trend). The findings were published online February 21, 2019, in JAMA Oncology. An inverse hepatocellular carcinoma association was also observed for total bran (HR, 0.70; P = .11 for trend), but it was nonsignificant. Additionally, increased intake of cereal fiber (HR, 0.68; P = .07 for trend), but not fruit or vegetable fiber, was associated with a reduced risk of hepatocellular carcinoma (but it was also nonsignificant). “If our findings [are] confirmed, increasing whole-grain or possibly cereal fiber consumption may serve as a possible strategy for hepatocellular carcinoma primary prevention,” said Zhang in an email to Medscape Medical News. Medscape Medical News also asked another researcher who has studied diet and liver cancer to evaluate the new results. Lemonica Koumbi, PhD, research fellow, Hepatology and Gastroenterology, Imperial College London, England, said the results showed that increased consumption of whole grains and bran and cereal fiber associates with lower hepatocellular carcinoma risk but not fruit or vegetable fiber. “It is a powerful study with excellent statistical methods. Nevertheless the associations shown are not very strong so I would say promising evidence with potential,” she told Medscape Medical News in an email. At Botanica Medica our Naturopaths are well aware of the importance of exercise, a good diet and the effect it can have on your life both physically and mentally. They come across lots of interesting studies and are always updating their knowledge. If you would like to make an appointment with one of our Naturopaths call Botanica Medica on 8271-1827 today. They are only to happy to share the knowledge they have gained through their studies and patient outcomes, and get you feeling better. Botanica Medica is located at 97 Glen Osmond Road, Eastwood and appointments are available Monday to Saturday including some after hours. study authors led by Xuehong Zhang, MD, ScD, Brigham and Women’s Hospital and Harvard Medical School, Boston.